I first heard about Ellis, because one of her patrons suggested that I would REALLY love her songwriting. I immediately became a patron myself. Then later met Ellis Delaney in person at the Rocky Mountain Song School & Folk Festival. She taught a really excellent workshop on planning, project management, and undefended living as an artist. 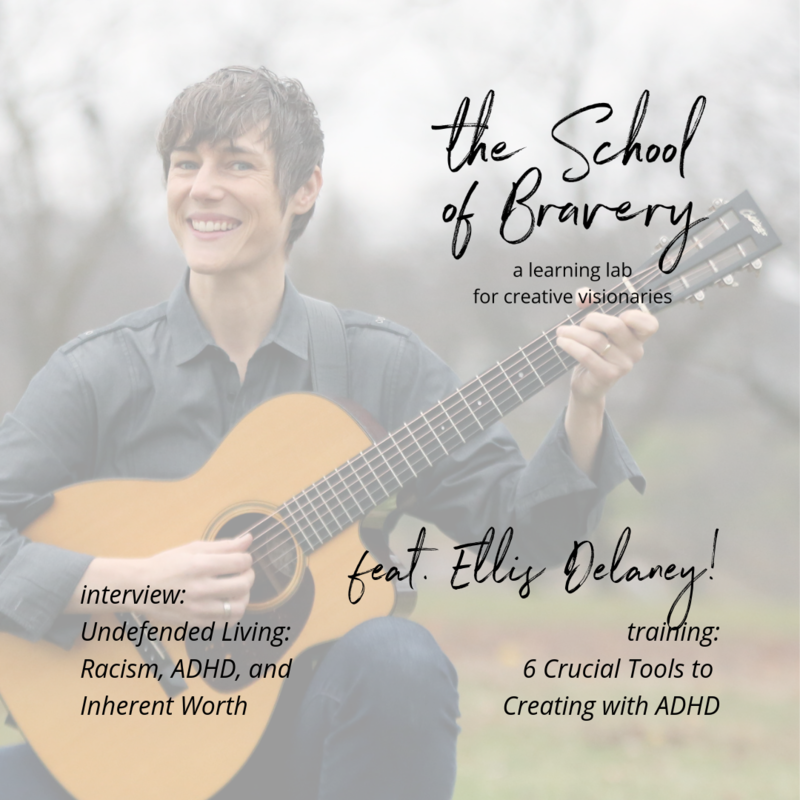 In that workshop, she briefly mentioned her ADHD and I just knew she would be a perfect guest expert for The School of Bravery. This month in the School of Bravery, we're focusing on the bravery ingredient of "Constraints." As an artist with ADHD, I knew she'd be a perfect guest expert to speak on this ingredient because she has so masterfully adapted to her constraint without letting go of the standards and expectations she has for her career. In this episode we talk about racism, pain, struggle, community, creativity, and a LOT more, specifically the topic of "Inherent Worth." This is definitely a conversation you'll want to continue with your friends and family, both online or in person. I know you'll love Ellis and her work as much as I do because she is so thoughtful, intentional, and compassionate. Yay Ellis! Ellis Delaney's Weekly Hotline: Call 612-998-2355 and you will hear a weekly encouraging message from her! The School of Bravery is a business learning lab for creative visionaries. Through monthly masterclasses, guest experts, weekly coaching office hours and so much more, you'll explore what it *really* means to "put yourself out there" and how bravery does not have to feel like a panic attack. Visit http://schoolofbravery.com for more info! A gifted songwriter and performer, Ellis is known for her stirring lyrics, open-hearted performances and contagious laughter. She got her start at coffee shops and now tours the folk circuit with nine albums to her credit. She has been a four-time guest on A Prairie Home Companion, and Ellis has won more than a dozen songwriting and live performance awards. Ellis says,"My goal is to make music that helps people find a sense of belonging, connection, and hope. The highest accolades come from everyday folks through meaningful emails, cards, and in person saying my music has made a difference in their life in some way." Yes! Call 612-998-2355 for her weekly hotline! Emily Ann Peterson is a singer/songwriter and bestselling author of Bare Naked Bravery: How to Be Creatively Courageous. She also founded The School of Bravery where she teaches bravery skills to creative visionaries. Her audience is found in Fortune500 companies, concert venues, bookstores, and living rooms around the world.